Congratulations on your win at Quilt Con! I love to see what you’re working on. I saw Sylvia’s Persistence quilt several years ago at a Georgia quilt show, and it stopped me in my tracks. Definitely some “Eye Ball ” quilts to drool over. Thanks for the wonderful giveaway! Loved seeing your quilts at QuiltCon. Such great negative space inspiration!! I’m still trying to wrap my head around your plan for the quilting on the negative space top. I’ve seen and admired your plaid quilts here on your blog and so I will be waiting to see more of this quilt. The book sounds intriguing. I like how you chose where to place the colors. I would like to see the quilting on it when it’s finished. 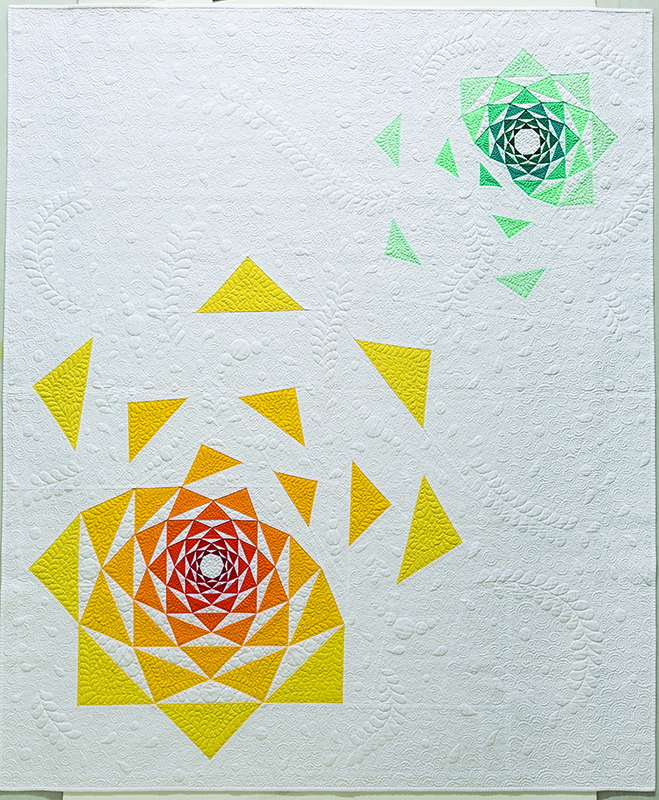 I saw Sylvia’s lecture about negative space at QuiltCon this year and it was so good! 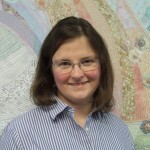 I didn’t know who she was when I registered but then I recognized some of the quilts in her presentation and now I notice her name and work all over! You just blew my mind with the amount of planning and math that goes into what could be mistaken as a simple quilt top design! I am going to follow your blog because I just can’t wait to see what you do with the quilting!! Glad you were a part of this blog hop so I could find you! I’ve been a great fan of Krista Wither’s for a long time! Two of my favorite quilts of hers: Diamond Mine and Soft Triangles incorporate a lot of negative space and her quilting is what first drew me in to this type of quilting and how effective it can be. 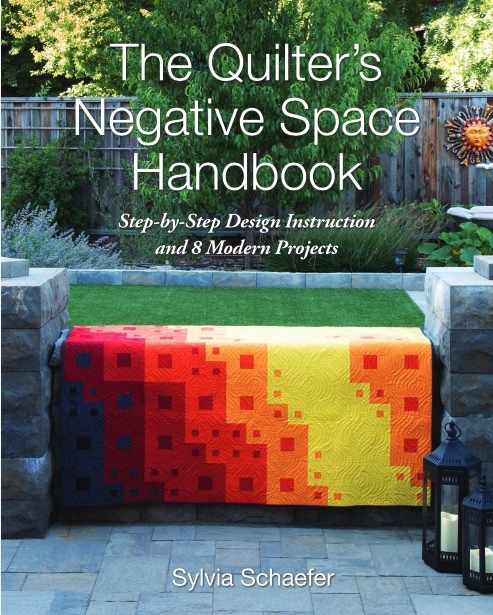 I would love to win a copy of The Quilter’s Negative Space Handbook! These are gorgeous. I love what negative space does in a quilt and when my art training can further my quilting experiences. Can’t wait to check this book out. What a clever way to create your design! I have only experimented a little bit with negative space but this book and blog hop has me interested in doing more. Cassandra – I have been admiring your quilts like this for awhile. Thank you for taking the time to explain how you make them. The plaid look is so beautiful – an excellent use of negative space and thread. As a professional statistician random number generators are part of the work. How fun to use them for something more artistic. Wow!! Will definitely be using this approach in one of my quilt designs! My favorite quilt that I made with negative space is Prism, a Zen Chic pattern. I enjoyed domestic machine quilting 42 different designs in it. Thanks for the chance to win! I love the idea of using a random number generator! Can’t wait to see this one progress! I don’t know if I have a favorite but I have so much to learn on this subject. 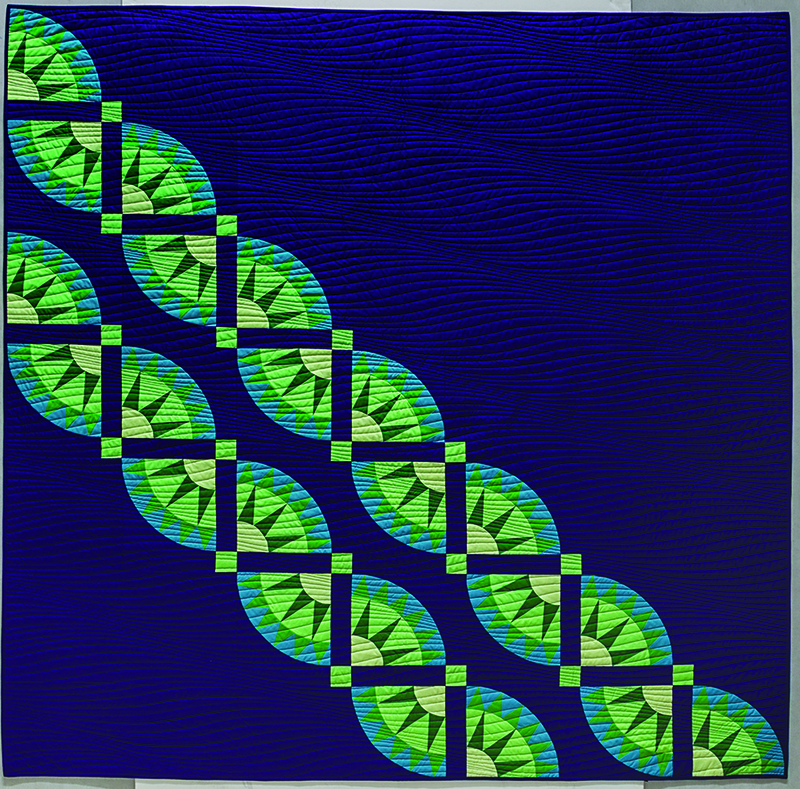 I totally love all of the straight and gentle curve lines used in the quilting. I would love to experiment with negative space! One quilt I love is “The Other Side” by Carson Converse. I studied negative space extensively in drawing classes, now I’m intrigued on how I could use it in my quilting! I feel like negative space makes a quilt. I always want to make one with lots of negative space. Wow, I can’t wait to see how you quilt your quilt. I’m sure it will be excellent! Thanks for sharing. Thanks for highlighting this book. It looks amazing! I like the Persistence of the disintigration of artichokes as it has wonderful piecing and beautifully crafted quilting. 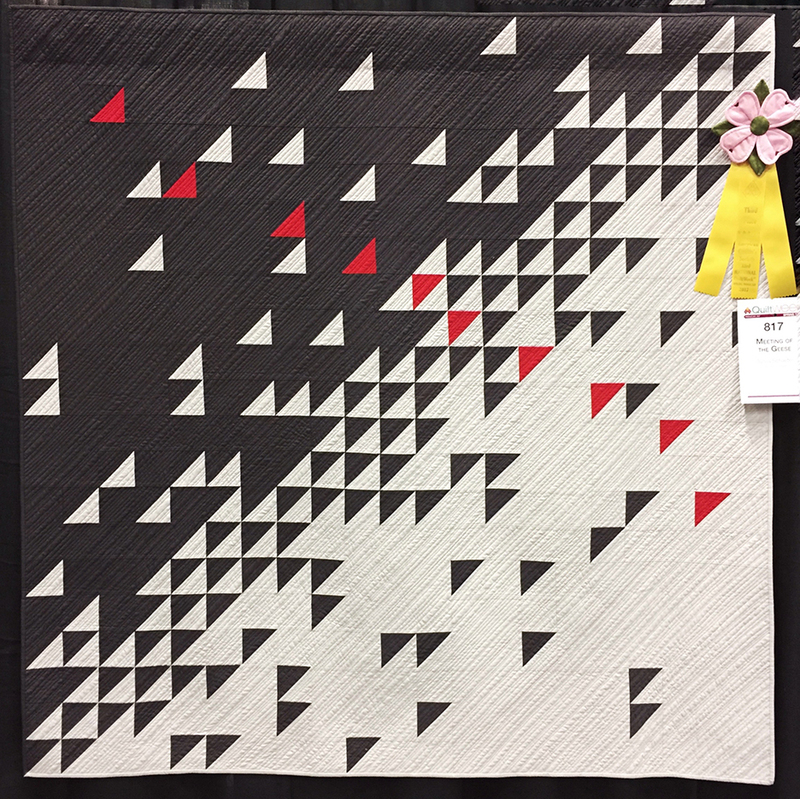 I have done very little modern quilting, but I did get to attend Quilt Con in Savannah and your plaid quilt hanging in that show was one of my favorites. I am intrigued by the idea of deconstructing traditional blocks and would love to read this book. Maybe an old(er) traditionalist can learn some new tricks. This is so gorgeous!! I can’t wait to see the final product! Thanks for introducing me to a great quilter and book. I enjoy books that are process or technique vs. More project oriented. 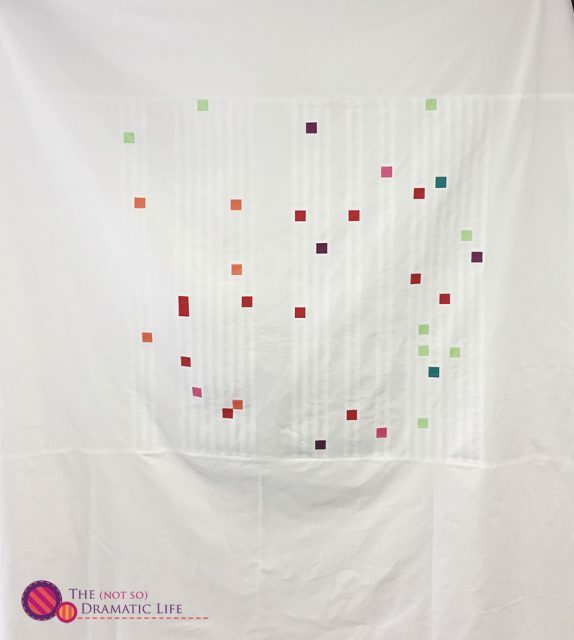 I love quilts with negative space, but only think “how am I going to quilt it?” I’d love to see all the inspiration this book has to offer! This is such an intriguing book! I love seeing quilts with a lot of negative space, but haven’t been able to get there with my own designs! Wowza, I love the Northern Lights quilt! I’m intrigued by this book! Adding it to my list, but winning a copy would be great too! Sounds like Sylvia uses a very structured approach to discussing negative space. She certainly creates some very striking quilts using her strategies. I look forward to learning with her. My apologies, if I have commented twice, but my internet went down in the middle of posting last time and I don’t have a way to know if my comment arrived. 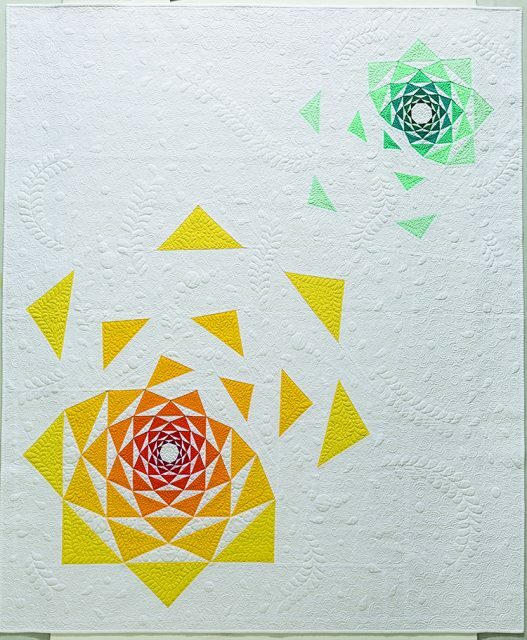 I love Sylvia’s artichoke quilt and others that I have seen which use disintegrating blocks. Looks like fun to try. so many that I love! I like several of Zen Chic quilts that use negative space, one I remember they used a shimmer fabric, I’m not sure what it’s called, but I really liked it. Would love to win a copy, if not, I’ll have to buy one!! Thanks! This book looks fantastic and I love your approach to your design! Love love love Sylvia’s book!!!! Been looking at a copy and lusting over the Northern Lights – such a great way to do a New York Beauty Block. Man the cover of her book is stunning! I’ve never used a RMG in quilt design, just draws, ha! Cool method. From what I’ve seen of your beautiful matchstick quilting, your design is going to be another winner. Cool eight concepts too, some of which I’ve heard of! It looks like a great book. I designed a quilt last year “It’s all about…negative space” with my take on the concept which featured negative images & words & my version of Mr Yuck in the center. It garnered quite a few comments 🙂 not all “positive” but hey that what originality is all about. I made one quilt with negative space! My flying geese quilt, with random rows and uneven numbers of geese, is a favorite!! Lots of just ivory- colored background, straight line quilting!! I’ve never made a quilt with negative space as I’ve been a bit intimidated. Loving the concepts shared from the book and would love to try one of my own. The quilt I really liked was all stripes. Almost the whole background used an off white fabric for the stripes and the rest had various sizes of fabric lengths. They were using the entire line of a fabric collection. I have so many favorites, I don’t think I can pick just one, but I am so attracted to all the designs in this book. They’ve sent my mind off in new and thrilling directions, and that’s a glorious thing at my age! I really like confetti quilts and plan on making one in shades of purple. The first two quilts in your post are designs that catch my eye since the triangles are flying of into space. I have never made a quilt with negative space. Thank you for sharing your thoughts and process. Also, thank you for the giveaway opportunity. 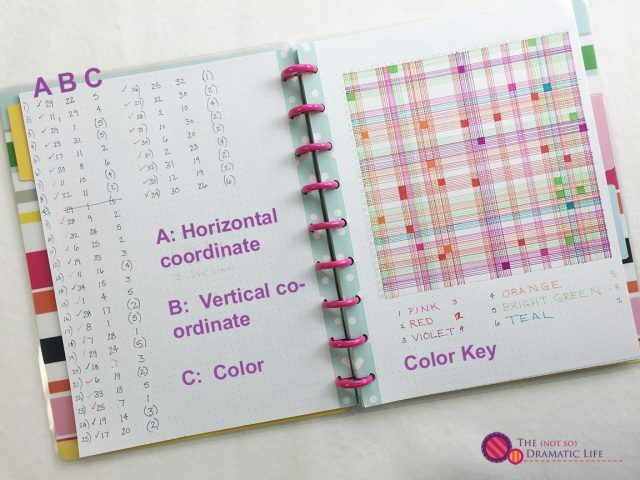 This book looks to be filled with great design ideas for modern quilts. Meeting the geese is amazing, I would like to make my quilting lines look that straight. Thanks for such an inspiring giveaway. Just found you through colorgirl quilts. I’m new to this endeavor, can’t wait to learn more! I recently attended Quiltcon and was introduced to the concept of negative space. There was so much inspiration there and i have so many ideas for future quilts!